PlateMate offers a unique micro-loading product in the form of a weighted magnet that adds small, incremental resistance to selectorized weight stacks for smaller weight jumps and safer workouts. Microloading with PlateMate is the safe, scientific way to build strength at beginning, intermediate and advanced exercise levels. Microloading with PlateMates is essential at all levels. Beginners and those in rehabiliation are apt to do exercises properly and avoid injury. Intermediates stay motivated because they experience steady progress. Advanced lifters benefit because microloading helps them break through "the plateau" to achieve success at the highest levels of weight training. 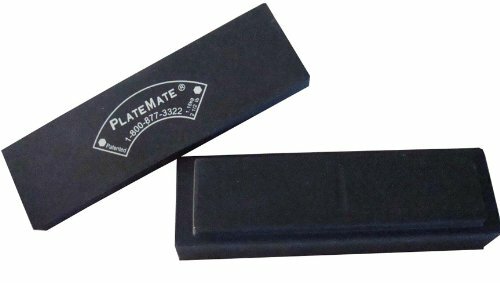 PlateMate weights include super-strong, rare-earth magnets that stick to cast iron and steel weight stacks. Magnetic PlateMates allow the user to utilize smaller weight jumps while lifting weights thus reducing the risk of injury to muscles, tendons and joints.PlateMates must come in direct contact with metal for an ultimate hold. PlateMates will not "stick" properly to surfaces that are coated with rubber, urethane, vinyl, plastic, neoprene or any other coatings that inhibit magnetic attachment. PlateMates have protective coating on the outer surface (opposite from magnets) so they do not scratch dumbbells, equipment, or other PlateMate bricks during use or storage. When the workout's finished, your brick attaches securely to the framework of the machine, so it is always easy to find. Includes (1) Brick Shaped Magnetic Add-On Weight, 2.5 lbs. Attaches to metal weights securely with super-strong magnet. Weight Stack NOT Included. Designed specifically for selectorized or stack weight machines. Build strength steadily with 2.5 lb increments instead of the typical 10 or 15 lb increases. Will not magnetically stick properly to surfaces coated with rubber, urethane, neoprene, vinyl.